SAVE $150 Off, March 14th thru Sunday, March 17th at 5pm Eastern time! 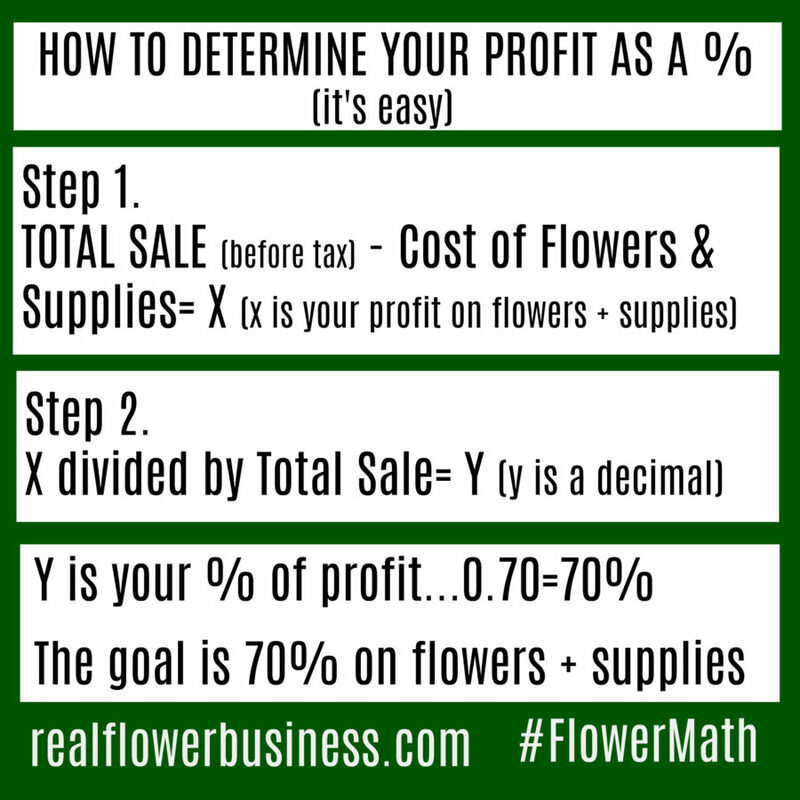 These formulas were taught to me in flower shops and many skilled florists I know often confirm with me that they consistently reach 70% profit margins on their flowers & supplies, too….so if you learned in floristry school or you’re a self-taught designer, you previously didn’t have access to these pricing formulas! Today you get them for just $449 (or 2 payments of $224.50). YUP! That’s it! If you’re not reaching your income goals yet, how are you going to change that? Enroll today before 5pm EST! 80% of florists I surveyed in 2018 said they are not reaching their income goals! Flower Math is the florist’s roadmap to pricing & profitability! Learn how to price with confidence & stop over-buying so you can increase your income with Flower Math! My impetus for purchasing the flower math course (in addition to the amazing savings!) was learning through what you share in the Facebook forum and getting the right amount of teasers for what else I could expect in this course. It is beyond helpful, and I am truly thankful for your expertise as well as the desire to educate others…. Thank you so much, and have a great day and weekend! Do you know what your profit margin should be? You’re a talented designer and your customers love your work, but is your business making enough money? Pricing formulas & profit margins are not a mystery. The goal is to make 70% profit on the cost of flowers & supplies*. The rest of your business expenses (labor, utilities, additional COGS, etc.) will come out of that 70% profit, which is why it’s so important to learn how to maximize this portion of your profit. What if you could make more money, without booking more events? Flower Math teaches you how to keep more of the money you’re already making so that you can increase your income without the need to increase your sales! Don’t make the mistake of being too afraid to look at your numbers & find out if you’re leaving money on the table. And Don’t fall for the myth that working from home means you can’t charge as much as a florist”. Of course you can! But most of all please Don’t make an excuse about “not having enough time”. I hear ya. I’m busy, too. You can complete this course at your own pace…probably in a few hours. You can approach the lessons in 30-minute increments or start it when you have 2-3 hours to focus on increasing your profits. Click here to take that first step & SAVE! Pro tip: It doesn’t matter what you charge, if you overbuy! When you enroll in Flower Math, you’ll be pricing with confidence and making a consistent profit in your business. for every $30,000 you sell, you’ll learn how to keep $6,000 MORE for yourself. Over the next 5 years, that adds up to $30,000 MORE in your pocket. This course will easily pay for itself over and over again as you grow your business and increase your sales. 0.1 Have a talent for design, but don’t have a firm grasp on the business-side. 0.2 Make a profit that’s less than 70% on the cost of flowers & supplies. 0.3 Don’t charge a design fee (or labor fee) on each arrangement. 0.4 Wonder if you can give up your day-job (or bridge-job). 0.5 Overfill orders and struggle with feeling guilty about charging for your time. 0.7 Are a home-based florist who’s never worked in a profitable flower shop. 0.8 You’re a flower farmer who’s expanding to offer wedding and event work. 0.9 Don’t feel 100% confident when you send a quote. If you said “yes” to any (or all) of the above, then, Flower Math was made for you. Click HERE to SAVE $150 OFF! allow you to log in anytime. You’ll have instant access to the entire course as soon as you buy. present easy to follow formulas, cheat sheets and supplemental videos to walk you through each step of the pricing process; from mark-ups to design fees to delivery & rentals to a special note to flower farmers! Remember: You don’t have to increase your sales to make more money. Flower Math gives you easy formulas for pricing flowers and supplies and also shows you how to keep more of the money you’re already making! Click HERE for profit clarity! Florists must feel confident in applying markups and design fees so that you can provide value to your clients and turn a profit at the same time! 0.1 Order efficiently to avoid overbuying so that you can keep more of the money you’re already making! 0.2 Apply a design fee to each arrangement. 0.3 Create floral recipes (and stop over filling!). 0.4 Apply industry standard markups to flowers & supplies. 0.5 Consistently make 70% profit on flowers & supplies. And I’ll show you how I do this all without any “budgeting”. Seriously. You can learn to do it, too. *PLUS you’ll get 4 Bonus Additions including: profits and breakdowns on 2 MORE real weddings (for a total of 5 real weddings), a special note for Flower Farmers on recipe creation and a downloadable pdf with my “starting prices” on wedding flowers and how the prices have evolved over the past 16 years! Turning a profit allows you to keep doing the work you do best. This is why it is so important. Are you focused on the wrong numbers? Pro Tip: Do you calculate your profits on flowers and supplies? If not, why not start now? It’s easy. Remember: Your additional COGs (the cost of doing business!) will come out of that 70% profit on flowers & supplies. Have you tried other courses & been disappointed? …Even after [3 other courses], it all seemed muddy. I told myself I’d give Flower Math a try and then no more courses. Transparency is what Flower Math is all about. I’m not going to tell you what I think you should do. I show you, step by step, exactly how I apply the formulas, create recipes, and put together wholesale orders. Click to Save $150 Today! 0.2 A step-by-step guide to apply the basic “flower math” formulas, (how to price “both ways”, i.e. determine the price of arrangement when you know the stem count and how to fill an order to value when you know the price, but haven’t created a recipe yet), which have been handed down from florist to apprentice throughout the years. 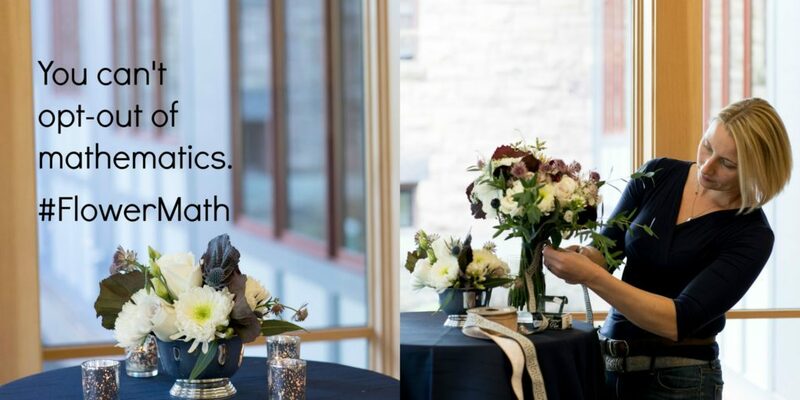 0.3 A true behind-the-scenes breakdown of 5 REAL weddings, each complete with a full list of recipes, COGS and profits of 70% on flowers & supplies so that you can see how the Flower Math works in real life. 0.4 Over 21 floral recipes including 5 different bridal bouquets, 5 bridesmaids bouquets, 5 styles of centerpieces (including a 19′ floral table runner, “eclectic glass vases” & a wooden box), an arbor, aisle flowers, large ceremony arrangements, flower girl baskets and more. 0.6 Pricing cheat sheets to calculate design fees for you so that you can consistently fill orders to value. 0.7 Over 45 minutes worth of video instruction with details on how to apply markups as well as how I create recipes and wholesale orders that are “tight and right”, to keep my cost of goods as low as possible. 0.8 E-mail support from Alison if and when you need it. I proudly stand behind this course. If you have a question for me, before, during or after taking a course, just get in touch! 0.9 Lifetime access! Check in for a Flower Math refresher any time…and if I add to or enhance the course you’ll have access to all future updates as well. As long as I’m running this course, you’ll have access*. *Bonus Additions: You’ll also get a full list of my starting prices on weddings over the past 16 years! 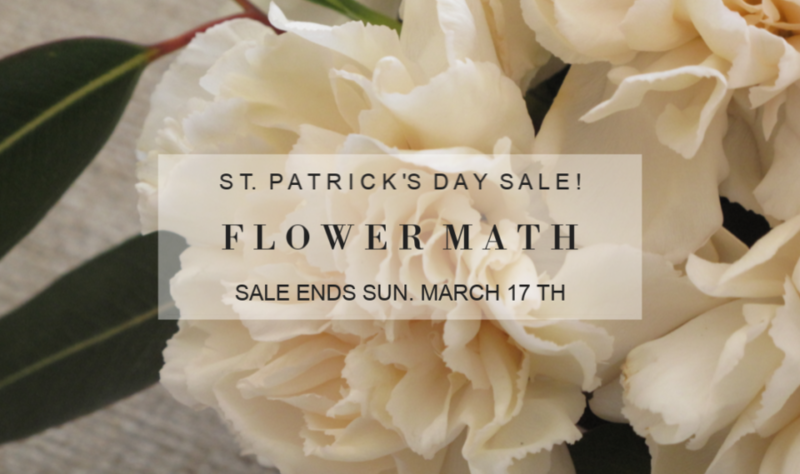 The full retail price of Flower Math is $599, but you can enroll Today for $449! I know Flower Math is an investment in your small business which is why I have multiple payment options for you. or make 2 payments with NO INTEREST FEE. 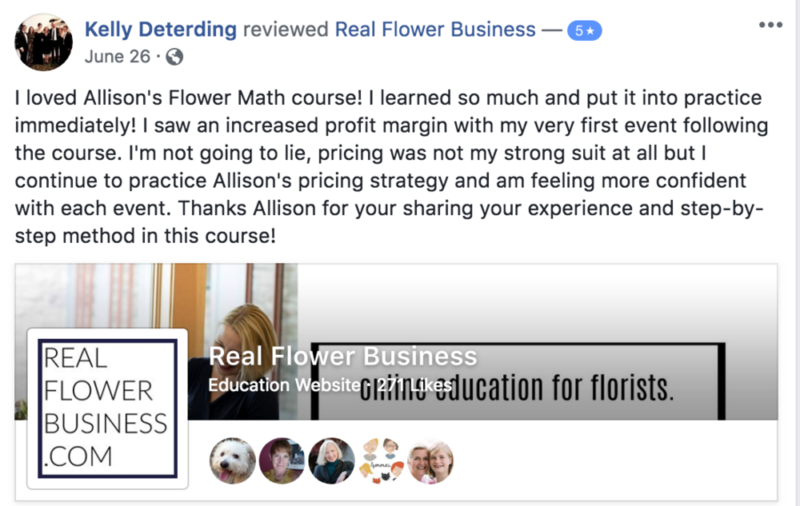 I know it’s not always easy to invest in your business (and taking an online course may seem “risky”…), but I am committed to providing tremendous value to the florists who sign up for my “stuff”. The florists who’ve completed Flower Math say that the value of the content far outweighs the cost. After signing up for Flower Math you’ll see the benefits of increased profit margins on every order for as long as you run your business. “Alison spells it out, not only through concise videos, but also through a series of written lessons and cheat sheets. Nothing can be mistaken as she actually shares real weddings from start to finish – recipes, flower orders and invoices – removing the mystery from the game. I created this course for floral designers who have a talent and love for flowers, but do not have anywhere to turn for mentorship to learn the business-side of the craft. From industry standard mark-ups and how to apply them to recipes and wholesale ordering, plus 5 real weddings worth of sales, orders, recipes & real profits—I’m taking you behind the scenes to show you how I run my floral design business. I know you will take these formulas, recipes, tips and advice and run with them. I love to help educate and empower floral designers to achieve their business goals, which is why I’m bringing you behind-the-scenes of my business! Both experienced designers and new business owners have written to tell me about a newfound confidence and reassurance around pricing their work. I am thrilled to hear these results. A course like this has never been offered before. Still not sure if Flower Math is right for you?